I am so excited to have found so many delicious healthy cookies! Everyone loves cookies, there’s no getting around that, so why not find some healthy alternatives? 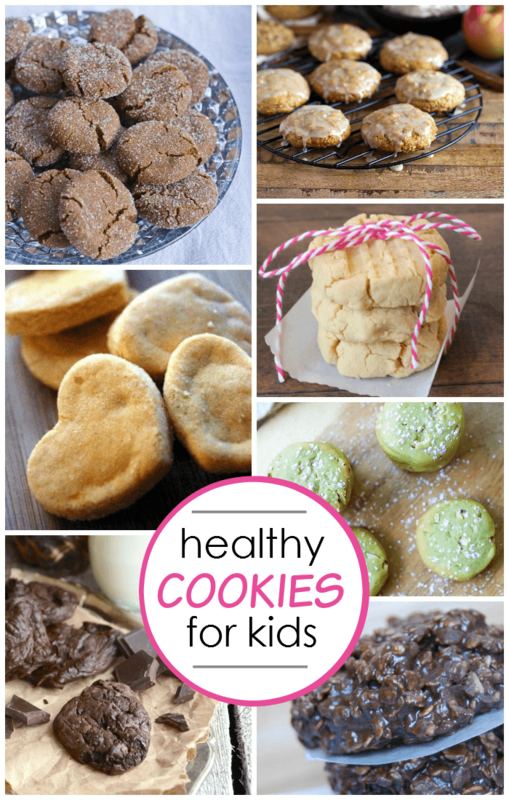 There are many gluten-free cookie recipes listed here for the GF sweets addict. I can’t wait to bake some of these for my kids. Some of them even sneak in extra goodness like sweet potatoes and avocados. Shh, don’t tell them! 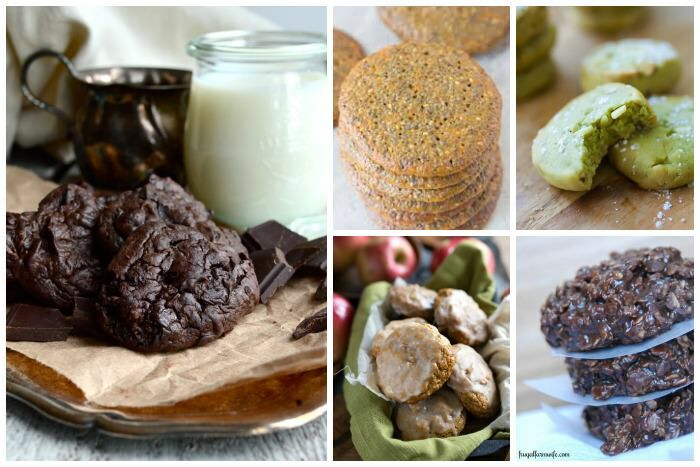 Avocado Chocolate Cookies – These experimental cookies turned out crazy good. They sound odd but taste amazing! From The Smoothie Lover. Healthy No-Bakes – These contain NO sugar! These are a delicious alternative from the regular no-bake recipe. From The Frugal Farm Wife. Glazed Apple Pie Cookies – Gluten-free peeps are going to love these because there is no flour! From Chelsea’s Messy Apron. Chia Seed Wafer Cookies – These yummy cookies get the nutrition of chia seeds in your kids belly via a sweet treat. From Savy Naturalista. Chickpea Cookie Pie – Sounds a bit odd at first, but you cannot taste chickpeas one bit! From With & Whistle. Healthy Oreos – Do you love Oreos? (Yea, me too.) Make a healthier version using this amazing recipe at home. From Chocolate Covered Katie. Dark Cocoa Nom Noms – These cookies (and the ones below) are from Nature Box. My kids and I loved these chocolate cookies. Blueberry Nom Noms – These are the blueberry version of the chocolate cookies listed above. So good. 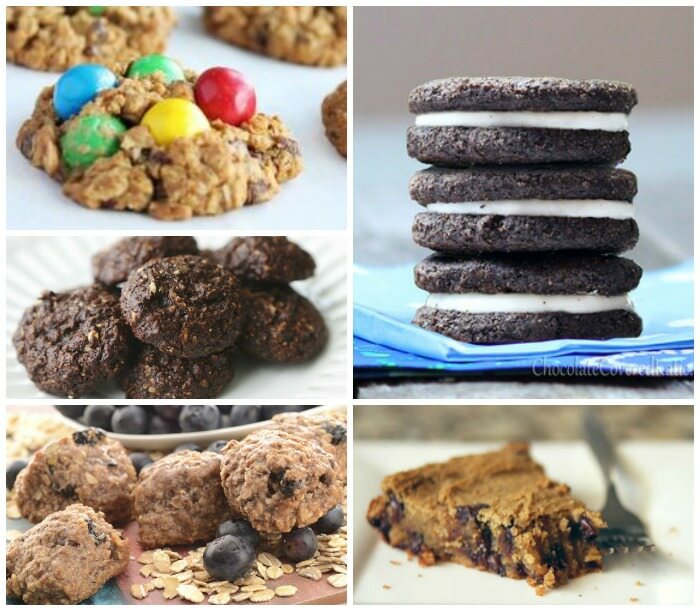 Monster Cookies – A healthier version of your favorite M&M chocolate chip cookies. From Delicious by Dre. Sweet Potato Cookies – Perfect little snack for toddlers! These are gluten-free, dairy-free and soy-free. From Little House Living. Shortbread Cookies – These amazing gluten-free cookies are made with coconut flour and just three other ingredients. From The Pink Sprinkle. Quinoa Gingersnap Cookies – Here’s another awesome gluten-free cookie. Have you ever heard of quinoa flour before? From Eating Bird Food. Banana Cookies – These are so easy to make using only two ingredients. From Kids Activities Blog. Blueberry Yogurt Cookies – Use Greek yogurt and fresh blueberries to make these amazing fluffy cookies. From Spoon Fork Bacon. Thank you so much for mentioning me here! I am honoured 🙂 Have alovely week!